Officials of various departments have cut a sorry figure before the visiting team from the Centre that is here to assess the damages caused by the recent rain in Nainital district. The border town of Pitthoragarh as well as the temple city of Almora, which attracts maximum Bengali tourists during the autumn, has suffered a lot. After a month marked by incessant rain, cloudbursts and landslides, it is now the threat of spread of diseases that looms over the disaster-hit areas of Kumaon. Scientists at the Directorate of Coldwater Fisheries Research (DCFR) located here have for the first time in India developed two new strains of common carp species. Since the strains have been developed at the DCFR facility in Champawat, these have been named Champa 1 and Champa 2. 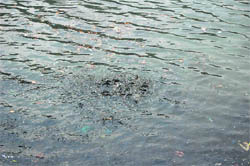 Fish in the Nainital Lake. Experts on fishery development from across the country have descended on Bhimtal to participate in a national consultation on Biodiversity of High-altitude Aquatic Resources, Conservation and Utilisation organised by the Directorate of Coldwater Fisheries Research (DCFR) located here. It was a day of enjoyment and celebration as Carman School celebrated its golden jubilee function here today. The function began with welcoming the chief guest, Governor Margaret Alva, amid persuading national anthem. Also, junior students presented welcome song that touched the heart of the audience. On Voluntary Blood Donation Day today, 75 units of blood were collected at the camp held today at Doon Hospital.The camp was organised by the Uttarakhand State AIDS Control Society (USACS) and State Blood Safety and Transfusion Society. As part of the Wildlife Week celebrations, a photo exhibition was inaugurated at the main convocation hall of the Forest Research Institute (FRI) here today.Photos clicked by students of FRI Deemed University have been put up in the exhibition. An innocuous mosquito has the Health Department worried. As vector-borne diseases continue to take hold of the state, the Integrated Disease Surveillance Programme (IDSP) of the department has failed to record disease patterns so that preventive measures can be taken before hand. On the eve of the Gandhi Jayanti, students at Kendriya Vidhyalaya, Ordinance Factory, Dehradun, paid homage to Mahatma Gandhi.A large number of schoolchildren, along with the teachers, participated in the programme. 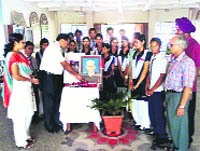 Birth anniversaries of Mahatma Gandhi and Lal Bahadur Shastri being celebrated at Kendriya Vidyalaya, OFD, Dehradun on Friday. Under the aegis of the NCC Directorate, the NCC, Anarwala, commenced a 23-day annual training camp here today.Around 513 NCC cadets from Nainital, Roorkee and Dehradun are participating in the annual camp. Eighty percent of the elderly feel there is no support system at the community level. Utilisation of community health centres (CHC) for chronic problems was the highest in Chennai (83 per cent) followed by Bhopal (17 per cent) while in Delhi NCR, it is extremely low (0.8 per cent) as most go to a private doctor (21 per cent), pointed out a survey conducted by HelpAge India and released today to mark World Elders’ Day. Skaters bringing laurels to the state at the National Skating Competition held in Bangalore from September 22 to 26 were felicitated today.Ashvin Raj of KV, FRI, won gold and bronze medals in the competition. While Akshat Johri (third time), Abhishek Bhandari, Saurav and Abhinandan (first time) participated in the competition to make the state proud. Governor Margaret Alva and her husband Niranjan Alva, a former student of St George's College, Mussoorie, attended a spectacular show of skill and grit at the annual school sports meet of the school here today. Kuldeep Chauhan of Sports College got the first place in the 10km cross-country organised by the District Sports Office on the eve of Gandhi Jayanti today. The pair of Himansi Rawat and Unnati Bisht beat Divyanshi and Unnati 21-5, 21-3 to win the under-10 girls doubles title during the 10th Uttarakhand State Sub-Junior Badminton Championship here today. 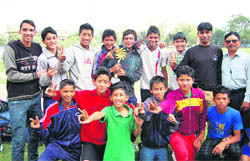 Under-16 Dehradun district team emerged champions in the state boys football championship held in Uttarakashi. The team reached the city today and interacted with the media on the Parade Ground. Officials of various departments have cut a sorry figure before the visiting team from the Centre that is here to assess the damages caused by the recent rain in Nainital district. It was the efforts of the District Magistrate Shailesh Bagauli and Kumaon Commissioner Kunal Sharma that saved the day. The officials on the other hand were quite unprepared to answer the queries coming from the members of the Central team. To begin with officials from the Tourism Department were not there to answer the queries related to the losses which the tourism sector has incurred during the past one and a half month. This happened when the team was being given a presentation by officials at the Administrative Training Institute (ATI) last morning. When an official was asked about the assessment of the extent of the damage caused to a stretch of road leading to Bhawali, he could only say: “The loss has been incorporated in the Rs 500 crore given by the Centre to the state government”. Then it was at places near on way to Betalghat that the officials were unable to explain the losses to the drinking water schemes in an effective manner. Their answers were quite misplaced at times. When they were supposed to physically point out the damaged schemes, they were seen referring to paper work. It was Bagauli who had to step in on several occasions to provide satisfactory responses to the Central team. Having toured the disaster-hit area at length over the past two weeks he was able to give convincing replies and suggestions. At one point a member from the Central team went to the extent of suggesting that the jumbo entourage of the officials be curtailed as it would save both resources and time. Besides the erring officials it was a couple of politicians from the ruling Bharatiya Janata Party (BJP) who played truant to the plans of the administration. Local legislator Kharak Singh Bora and his followers were evidently more interested in taking the team to his constituency. It came as a surprise that at certain points the villagers were ready with memorandums for the “Kendriya Jaanch Aayog” (Central Investigation Commission) as they understood the team to be. It is pretty evident that the writing of memorandums and bringing of the team to particular spots was well planned. The border town of Pitthoragarh as well as the temple city of Almora, which attracts maximum Bengali tourists during the autumn, has suffered a lot as the 75-km-long portion of the Haldwani-Almora highway is still not fully operational affecting the essential supplies to both district headquarters and satellite towns. “The road washed away on September 18 will, at least, take one month to be able to transportable between Haldwani and Almora,” said a PWD engineer. The Almora district administration has anyhow maintained the supply of gas cylinders and other essential goods from either the Ramgarh-Mukteshwar road or the Lamgara-Bhimtal road. “But, the tourism sector has suffered the most as the Bengali tourists, who used to flock Almora at this time of the year, are nowhere to be seen,” said Suvardhan, District Magistrate, Almora. “Not only Almora, but nearby towns of Jageswar, Binsar and Kaushani have also suffered from the tourists inflow point of view,” he said. The residents of Almora are also suffering the increase in the prices of essential goods as alternative way involves 60 km extra mileage from Haldwani Mandi. “Though the essential goods are available in Almora town, their prices have increased 10 per cent to 20 per cent,” said Rajendra Singh, a resident of Almora town. 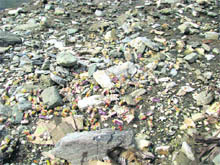 The Pitthoragarh town totally depends on Haldwani Mandi for the supply of fruits, vegetables and other grocery items, but after the Haldwani-Almora highway damaged 13 days ago, the prices of vegetables and other essential goods have increased sharply in the town. 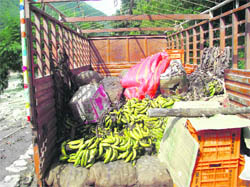 “The prices of all goods have increased from Rs 50 per quintal to Rs 75 per quintal, but the prices of vegetables have gone beyond the reach of common man as the trucks carrying vegetables now cover an additional distance of 60 km to reach Pitthoragarh via Tanakpur from Haldwani,” said Pawan Joshi, president of the Pitthoragarh Traders Union. PWD workers involved in the task of opening the road from Haldwani to Almora have a slight complaint of lack of sufficient infrastructure to do the job and face the public pressure of opening it much earlier. “We have deputed some 10 JCB machines and hundreds of labourers of our gangs, including a big number of engineers, but keeping the crunch of other technical material and skilled manpower we will try our best to open it with in a month,” said SC Arya, Executive Engineer, Construction Division, PWD. The existing conditions marked by the continuing blockage of roads to remote areas has made things difficult for the administration. In the villages that are cut off, the true picture on the health front remains unknown. The much-claimed 108 emergency health service is also paralysed. The ambulances are not able to reach the remote areas to pick up patients and transport them to health centres, an act that the service had been effectively doing. For now, patients in certain areas are being carried on palanquins and cots to the point till where the roads are open and then transported to hospitals. Chief Development Officer (CDO) Deepak Rawat agreed that there was a threat of an outbreak of waterborne diseases in the disaster-hit villages of the region as drinking water schemes have been the worst hit in the calamity. People are compelled to drink water from natural resources and there is a high probability of this water being contaminated on account of the recurring landslides, mudslides, falling of boulders and several other factors. “The positive part is that chlorine tablets and bleaching powder has been supplied to every village and people are being advised to use them,” he said. Chief Medical Officer (CMO) DS Garbyal said that another supply of chlorine tablets has been sought. He pointed out that his department had been carrying out a mass awareness campaign in all areas across the district to prevent the outbreak of diseases. He claimed that the Health Department has been able to tackle the spread of dengue in the areas of Haldwani, Lal Kuan and Ramnagar. However, he agreed that there was a lot to be done on the preventive front. He said that his department was doing whatever it can with the available manpower and resources to tackle the situation. He claimed that there was no dearth of medicines in the dispensaries and health centres. With the state government failing to take timely initiatives, the already pathetic health scenario in remote areas has got further aggravated. For example, there is only one regular and one contractual doctor operating in the entire Okhalkanda block of Nainital district which is one of the worst-affected areas. Similarly, a majority of health officials posted in Betalghat block, another disaster-hit zone, are on leave as they are doing their post-graduation and there have been no replacements till date. Ironically, the health portfolio is with the state Chief Minister Dr Ramesh Pokhriyal Nishank. He was on the defensive when he was quizzed on the issue by The Tribune during his visit to Nainital a few days back. Agreeing that there is a massive shortfall of doctors in the state, all that he could say was that things are improving and will improve in the days to come. As of now, there is a shortage of 45 per cent of health professionals in Nainital district alone. According to NN Pandey, who was involved in the experiment for developing the two strains: “Champa 1 is a scale carp while Champa 2 is a mirror carp. The highlight of these two strains is that their growth is one and a half times compared to the common carp. They can attain a weight of 350 grams after one year. This is a major impetus in our efforts to promote cold water fisheries in the state of Uttarakhand”. His colleague and associate in the project S Ali said the strain of these two carps had been imported from Hungary and developing them in high altitude conditions in Uttarakhand was a major challenge. He said the common carp had been imported in India about four decades ago from Thailand. The Director of the DCFR, Dr PC Mahanta, said as of now Champa 1 and Champa 2 were being bred in a restricted manner but very soon these would be distributed to farmers in various hill states of the nation. He said there was a tremendous scope for breeding these two varieties in the states of the North-East and those located in western Himalayas. Responding to a query on the demand of fish as an edible commodity in Uttarakhand, Ali said the fish constituted a part of the normal diet of the people in the hilly terrain and its demand was more than the supply. He pointed out that maintaining a proper supply in the remote areas was a big challenge as fish was a highly perishable commodity. Hence efforts were being made to promote fisheries in the hill region. He further said fisheries could form an integral part of the vocation in rural areas here. Farmers could utilise water ponds for taking water for drinking and irrigation purposes while also rearing fish in them. It was disclosed that Champawat district had scripted a major success story in developing fisheries. As of today there are no less than 200 fish ponds in the district. The scientists at the DCFR are now aiming at promoting trout-rearing in the region. The neighbouring state of Himachal Pradesh has been doing well on this front. The event began with the former Vice-Chancellor of the Sher-e-Kashmir University of Agriculture, Science and Technology Dr MY Kamal seeking that a proper policy be framed on utilisation of the aquatic resource system. He said that the area of aquatic resource system is under serious threat and the issue needs to be addressed at the earliest. He pointed that the area was being neglected and there was a need for a full-fledged policy like the policy on land utilisation in the context of agriculture. He called upon scientists to generate greater understanding with regard to the problems of various species of fish and laid emphasis on augmentation of export-oriented fisheries. Former member of the Agriculture Scientist Recruitment Board (ASRB) Dr SAH Abidi asserted that planners and scientists need to be sensitised with regards to the judicious utilisation of resources. He also expressed concern over virgin ecosystems being pushed to the periphery. Dr B Meenakumari, Deputy Director General (DDG) of the Fisheries Department of the Indian Council for Agricultural Research (ICAR), talked at length about promoting cold-water fisheries in the high-altitude regions. Pointing that fish consumption in these areas was quite high, she said that the problem exists in marketing of fish which was a highly perishable item in these areas. 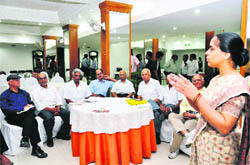 She said that there was tremendous scope for developing cold-water fisheries in these areas. Dr Meenakumari laid emphasis on value addition to fisheries and said that in modern times, open and heat packaging of fish was being sought by consumers. Dr PC Mahanta, Director, DCFR, said that there was a lot of potential to develop cold-water fisheries in northern and north-eastern states. Referring to the lack of manpower in his institution, he said that the DCFR was now collaborating with other institutions of excellence doing research in the fisheries sector. Principal GIG Mann presented the reports of 50 years of excellence and achievements of the school in various fields and mentioned the name of students who got laurels to the school in the field of engineering, medicine, politics and mass communication. In fact, the oldest teachers and Class IV employees were also awarded for outstanding job in their respective field. Followed by which, the students enthralled the crowd with songs, drama and dances. “This day holds a lot of importance in the directory of our school functions, from parents, students and guests, everyone has a great significance as well as gala time to celebrate the jubilations,” said Mann. The function concluded with vote of thanks as well wishing the students very best for future endeavours. Despite the enormous demand for blood, voluntary donation is very less. 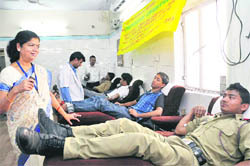 “The Dehradun blood bank requires 600 units of blood every month. 200 units are usually provided through camps and 400 units of blood are received through replacement,” said Dr SK Nautiyal, senior pathologist, Doon Hospital. These days, the demand for blood, especially platelets, is running high as a number of dengue cases are being treated at the hospital. He added that through voluntary donations, one per cent of the demand can be easily fulfilled provided there is awareness about voluntary blood donations. Those present at the camp included Dr Meenakshi Uniyal, Director Blood Safety and Parvati Pandey. To send message of “Donate Blood Save Life”, the UNESCO Club, Dehradun, is holding eighth Dehradun Race on October 3. The race will be inaugurated by Governor Margaret Alva. Event convener Vivek Agarwal said the race would start from the Pavilion Ground at 9.30 am and would pass through Kanak Chowk, Subhash Road, Bahal Chowk, Clock Tower, Paltan Bazar, Raja Road, Gandhi Park, Darshan Lal to culminate on the Pavilion Ground. Schoolchildren of any age group can participate in the race. After the race, the students will be served refreshments and fruits. They will also be given away kits, T-shirts and caps. Participation certificates will be awarded to all participants. Hundred participants will also be given Sonata wristwatches as gifts through lucky draw. This was announced during a press conference at a city hotel in the presence of the club members. A special exhibition section dedicated to photographs clicked by photojournalist Bhumesh Bharti has also been created. Inaugurating the exhibition, Dr SS Negi, Director, FRI, said the institute had been celebrating the Wildlife Week every year and had been organising number of programmes. He said the photo exhibition dedicated to wildlife was aimed to sensitise society towards importance of the wildlife. Dr VRR Singh, AS Rawat, Dr P Soni and Dr KP Singh were prominent present on the occasion. While the IDSP continues to track the day-to-day cases pertaining to communicable diseases, no effort is being made to record tendencies of a particular disease for its complete eradication. Battling with the rising number of dengue and malaria cases in Ram Nagar and Udham Singh Nagar, the department has even sought the services of the National Centre for Disease Control (NCDC) as most of its efforts have failed to control the disease. The team will be visiting Uttarakhand this week and is expected to hold consultations with the department on the methodology being deployed for controlling the diseases. “There has been a lacuna in our health delivery system that neither the tendencies nor pattern of diseases in the districts are being compiled, though under the IDSP prevalence of disease is being tracked on monthly basis, we lack sophistication in actually recording the tendencies so that complete eradication of the disease takes place in the state,” said Dr HC Bhatt, Director of the General Health and Family Welfare. Routinely reports about children falling prey to a mysterious disease and brain fever continue to emanate from Tehri and Champawat, but the cause of the disease has not been pin pointed yet. Experts say that the state failed to utilise the opportunity to set up a testing laboratory where sophisticated tests could take place. Despite visits by the NCDC team, a sophisticated laboratory where culture tests could take place surprisingly is not on top of the agenda of the government. The programme initiated with lighting of the lamp and offering garland on the photograph of Mahatma Gandhi followed by a speech on his life and work by school Principal Kalika Prasad. While addressing students during the programme, the Principal encouraged them to follow the path of non-violence, peace, harmony and brotherhood. 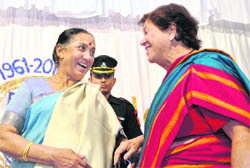 Also, she spoke about Lal Bahadur Shastri and his faithfulness towards the country. To end up with the programme, students sang “Raghupati Raghav Raja Ram” and “Vaishnav bhajan” as the remembrance of the Father of the Nation. While addressing the cadets, Colo PK Sharma, camp commandant, said: “The camp is aimed at conducting activities which would include both of military and non-military subjects, social services, career counselling, disaster management, traffic control, treks to underdeveloped areas, national integration camps, unit attachment camps, combined annual training camps and others”. With increasing age and reduced financial power, the elderly find themselves at crossroads, say the findings of the survey. Primary health centres (PHC) are also not popular among the elderly as they prefer going to private clinic/hospital or a district hospital in the time of need. “Free treatment, health care and financial aid are the major needs of the aged but absence of government facilities compounds their problem. Most elderly people with ailments preferred going to a private doctor (23 per cent) as against a PHC which was about 12 per cent,” said Dr Aapga Singh, Deputy Director Programmes. The survey was spread across eight cities in India: Delhi NCR, Mumbai, Ahmedabad, Kolkata, Bhopal, Chennai, Patna and Hyderabad. In the next phase, some more cities will be covered including Dehradun. After the release of the report, a meeting of the Federation of Senior Citizens Association of Uttarakhand was held in which many elderly persons actively participated. 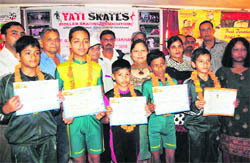 Roller Skating Association convener Anju Gupta said this was the eighth time that the state won medals at a national meet. The special guest, Winter Games Association of India president SS Patwal, congratulated the winners and gave them certificates. He said a “Skating Champ Hunt Show” would be organised by the association from October to December. 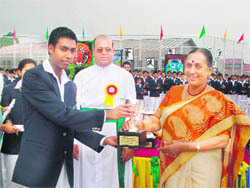 Uttarakhand Governor Margaret Alva hands over a trophy to a winner at the annual sports meet of St George’s College in Mussoorie on Friday. Governor Margaret Alva and her husband Niranjan Alva, a former student of St George's College, Mussoorie, attended a spectacular show of skill and grit at the annual school sports meet of the school here today. On the occasion, St Georges College gave a cheque of Rs 1 lakh to the Governor for the rehabilitation of victims of recent natural disaster in the state caused due to unprecedented rains. The Governor, who is also the state chairperson of the Red Cross Society, said the funds would be utilised through the society to provide succor to the disaster victims. Alva, who presided over the today's programme, also presented the rolling trophies to the winners. Speaking to a large gathering comprising old and present students, teachers and parents, she complimented the students for giving their best performance in various sporting events. The spectacular display of sporting talent at the meet has indeed been a delight to watch. Participants at meet have lived up to the high standards for which the college is well known. The immaculate turnout and discipline of the students has been exemplary," she said. The Governor said, "The beautiful campus of St George's College has produced some of the most outstanding personalities. The students of St George’s College, Mussoorie, popularly referred to as ‘minorities’ have excelled in virtually every sphere of activity, including administration, sports and adventure sports, defense, art and crafts, cinema, judiciary, television production, broadcasting and communication”. She said her husband studied here from 1952-55 and hence the place had a special significance for her as well as her family. The Governor also announced the contribution of a trophy - the Niranjan Alva Trophy, to the school, which would be given to the fastest runner at the annual school sports meet from 2011 onwards. Earlier, the Governor hoisted the sports meet flag after which the games torch was lit. She declared the sports meet open at which balloons were released in the air. The meet was marked by organising of various racing events, PT displays, gymnastics, relay races and march past by the four Houses. A large number of old students, who were present on the occasion, gave away the prizes to winners of different events organised today. Mussoorie MLA Jot Singh Gunsola, Principal of St George's College Brother Christopher Dawes, Vice-Principal Brother Edward, Brother Superior Brother TJ Muldowney and Principal of St Mary, Delhi, Brother Dominic Jacob. 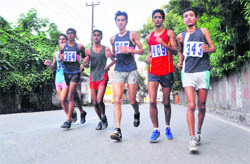 Amar, Jagdish, Vineet Saini, Naveen Parihar and Upender Lal, all of sports college, stood second, third, fourth, fifth and sixth during the event. The race was flagged off by Station House Officer of Kotwali police station Inspector Kailash Panwar. The race began from Astle Hall and returned from the Mussoorie bypass to the same point. The winners were given prizes by chief guest KC Kukreti, retired Principal of Oak Grove School, Mussoorie. Deepti and Himanshi of Dehradun got the better of Ambali and Sara Bora of the same district in the under-13 girls doubles semifinals. The score was 21-16, 18-21, 21-19. In u-16 girls doubles, Sweeta and Soni defeated the pair of Anmol and Megha, and Smriti and Ambali paired together to beat Anushtha and Siwani. While in u-13 girls singles, Sara Bora beat Shivangi, Smriti defeated Sweta in the u-16 girls singles. In u-10 boys doubles semifinal, Chaynit and Tushar of Almora outplayed Aryesh and Abhinav of Dehradun 21-8, 21-4. Lakshya and Dhruv beat Pranav and Shivam of Almora 21-2, 21-6. The Doon team beat Haldwani 2-0 in the final to grab the winning title. Shubham Rawat and Sumit scored the two important goals. The team won all matches almost easily during the championship. 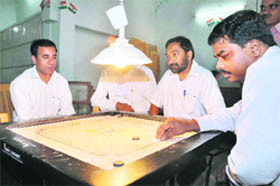 Ten teams took part in the competition. Team players are: Nitesh, Mahender, Deepak, Raja, Suraj, Tag Tallu, Chuku Tagar, Abhinav, Vaibhav, Depender Negi, Mousang Rang, Prabhat Gurung, Mohit and Ayush. DS Rawat was the officiating official with the team.